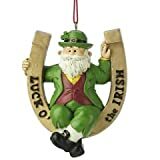 You don't have to be a leprechaun to love these Irish ornaments. 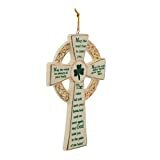 Celebrate your Irish heritage with beautiful and affordable Christmas ornaments. Here's a collection of Irish ornaments for every type of Christmas decoration. 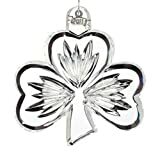 Traditional Belleek ornaments with Irish blessings, romantic Claddagh ornaments, inspirational Irish Crosses, patriotic Irish flags, whimsical leprechauns, and of course shamrocks galore! You'll love how your Christmas tree looks when you include Irish ornaments. Playful leprechauns poking out from the green Christmas tree add a touch of whimsy. Belleek blessing ornaments remind us of the true meaning of Christmas. 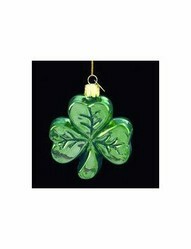 Shamrock ornaments are always popular and your love the ones designed by Kurt Addler, Waterford or Lenox. You'll Love this Celtic and Irish Gives Too! Irish eyes will be smiling when you give your buddies an Irish ornament for Christmas. It's a great pick-me-up gift for friends who are going through hard times. If you've got a friend who's lost their job or had their hours cut, give some emotional support with a whimsical leprechaun ornament. Attach a note saying you know that they'll find their pot of gold soon. Emotional support with a touch of humor is a good way to help keep up peoples' spirits in hard times. 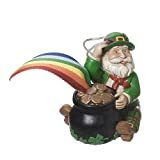 Leprechaun and Irish good luck symbols are very popular with the family members and friends I know that like to hit the casinos and bingo parlors. So Irish ornaments are always welcome stocking stuffers. Irish culture is thousands of years old -the city of Dublin is over 1,000 years old itself - and it has a great deal of mystical or Celtic lore attached to it. So it's no wonder that they have wonderful imagery like rainbows, leprechauns and pots filled with gold. Irish blessings and toasts are truly beautiful and Belleek is a trusted and beloved Irish brand. Combine the two and you'll have Christmas ornaments you'll be proud to include in your own Christmas decorations or to give as a gift. 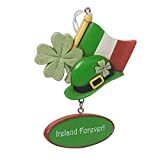 The first ornament shown below is the most famous of all Irish blessings or toasts. The second ornament includes a marriage blessing and is perfect for a first Christmas ornament. The third ornament is a house blessing ornament - always approrpriate but wonderful for an Irish housewarming gift. 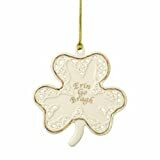 The Belleek Marriage blessing ornament has a traditional Irish blessing and is decorated with shamrocks, colorful flowers and two rings. Belleek House Blessing Ornament is decorated with shamrocks and the words "Bless this House" in green lettering. From three of the most respected names in decorative collectibles - Waterford, Kurt Adler, and Lenox - three beautiful shamrock ornaments. I love wrapping Christmas presents in unique ways. A Christmas ornament is a great way to make a gift sparkle. Sometimes I relate the ornament to the gift as to give a hint. But other times I use it to throw the gift recipient off the track and truly suprise them. You can also use shamrock ornaments and other Christmas ornaments as dinner place settings for your Holiday gatherings. I love to put an ornament by each place and leave the name blank. Then I ask the dinner guests to decide which ornament matches the personality of each guest and choose where they should sit. This inspires all kinds of conversation and storytelling. As you can see to the right a shamrock ornament doesn't always have to be green. 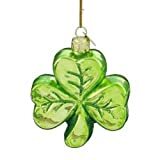 While the Kurt Adler shamrock ornament is a beautiful green glass, the Waterford shamrock ornament is a stunning clear crystal glass. The Lenox shamrock ornament is a high-quality white china with 24K gold accents. Of course put them on your Christmas tree, but take them out again a few months later for St. Patricks day and let your imagination wander. A front door wreath embellished with these ornaments would be the perfect way to greet your guests as they come by for your annual corned beef and cabbage dinner. 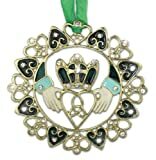 If you chose claddagh wedding rings then you'll definitely love adding a claddagh ornament. An Irish cross with a blessing is a touching sentiment. And just be proud to be Irish with an Irish flag! I love the traditional woodcut ornaments shown to the right. Not only do they portray traditional Irish values, they will add a timeless feel to your Christmas tree. If you're trying to make your tree look like you've been collecting Christmas ornaments for decades - or even have inherited family heirlooms that are generations old - then be sure to include some wood ornaments on your tree! From flying snowmen and Santas to Irish dancers, you'll love these Irish-themed ornaments. While these will look great on a traditional green Christmas tree, a table-top Christmas tree will really show them off! So what about you? Will the luck of the Irish be inspiring your Christmas decorations this year.